24-Aug-2009 -- Continued from 44N 41E. This was our last attempt in our summer holidays 2009. We left Russia after our second CP in Karachay-Cherkessia and travelled back to Trabzon. We had some days left and so Philipp was curious if another visit would be possible. The closest CP which wasn't already visited was 41N 42E in the Artvin Province. 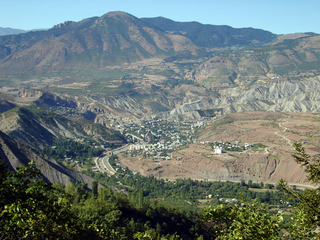 The Artvin Province is part of Eastern Anatolia and is in the north-eastern corner of Turkey. It is bounded by the Black Sea in the North and Georgia in the East. It's a mountainous area with very high mountains up to 4000 metres. We started in the morning and travelled with our rental car along the coast towards the Georgian border. We passed Rize and Ardeşen and short before Hopa we turned upcountry. The mountainous region and the bad state of the roads slowed us down. In the early afternoon we reached the huge Borçka Hydro Power Station at the Çoruh River. The street follows the catchment lake for about 30-40 kilometres. Then we encountered another system of gigantic hydropower plants still under construction. We drove past Artvin and entered the beautiful Ardanuç Canyon. It was already in the afternoon and it was still a long way to our Confluence somewhere in the mountains. The map showed a small road from Ardanuç via Torbalı to Meşeköy but we missed it somehow. A road construction zone stopped us a few kilometres after Ardunuc. We asked one of the operators - he pointed somewhere at the map but we were not sure that he could really read it. Driving back we passed a small junction and the GPS pointed in the right direction. We crossed a small river and then we winded uphill for many kilometres. After an hour we stopped and checked the map again when suddenly a police car turned round. An officer got out asking what we were looking for. They had followed us for many kilometres and couldn't figure out what we were doing in the middle of nowhere. We explained that we were looking for the little village Meşeköy and that we were not sure about the direction. They pointed us the way and said goodbye. The road wasn't in good condition but we were confident to bring back the rental car in one piece, so we headed forward as swiftly as possible. We reached a small village which wasn't on the map and some boys pointed us in the right direction. We had climbed up to more than 1500 metres above sea level. The Confluence was still in more than 7 km distance and it was already late in the afternoon when our travel was suddenly stopped by a road construction zone. A digger and a crawler blocked the street. The more important problem was the softened substructure of the road. It was impossible to make it past the construction vehicles. We discussed to stop there and walk the last few kilometres. It was about 6:30 p.m., we were in 4, 5 kilometres distance and still had to climb a few hundred meters according to the map. After some discussion we decided to turn around and drive back. We were compensated by a superb view over the Anatolian mountains in the late afternoon sun. It was stunning. On our way back we visited the Cehennem Deresi Canyon where we again met the police officers who were waving when they passed. If you are going to visit this Confluence, maybe it would be best staying overnight at Artvin or Ardanuç, so you can make an attempt starting early in the morning. We are sure reaching the CP is not a very tricky undertaking, but you need a little more time than we had.